I love baseball. 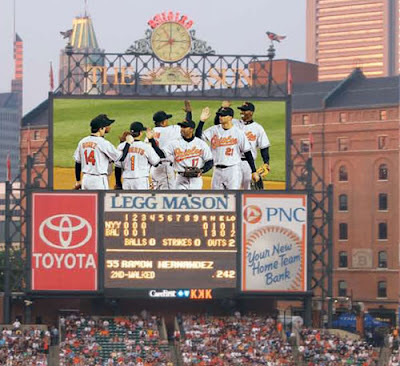 I played it endlessly while growing up, played in adult softball leagues when I got older (until my knees gave out) and now follow my childhood team the Baltimore Orioles. During my time in the military I coached Little League baseball for a couple years and when my son Julian was growing up I helped coach his teams as well. My big dream in life was to be a baseball coach. But it is getting harder and harder to have any respect for the "big leagues" - the so-called professional game these days. Big money has taken over the sport and the players and owners have gotten so focused on the "bottom line" that they've left the fan base cynical and broken hearted. The latest steroid scandal in baseball is just more of the same bad news for the fans. Players that we have grown to admire are being revealed as serial drug users. (My team had 19 past and present players on the juice according to the Mitchell Report that came out yesterday.) The owners, despite their high moralism today, have known for years that players were using "stuff". They didn't care because more home runs and more high flight pitching was selling tickets and putting money in all their pockets. It was only when the reality of drugs was getting so out of hand, and hard to hide any longer, that the owners decided on this recent witch hunt. Once some well-known players started naming names in their books the public pressure on the owners was just too much. When you had players like Barry Bonds and Roger Clemons getting better as they were getting older they were defying nature. Players in the old days slowed down, hit for lower average, their pitching arms wore out as they aged. It has all become just too obvious. The so-called commissioner of baseball, former owner, Bud Selig is a joke. He should be fired for having allowed this whole episode to go on for so long. And we should take the profit out of professional sports by having public ownership of professional sports teams. The Green Bay Packers are owned by their community and have done just fine under the circumstances. Baseball's most expensive player, Alex Rodriguez, just signed an obscene contract with the New York Yankees for 10 years and $275 million. As long as you allow those kinds of dollars to be floating around for a ball player there are all kinds of incentives for less skilled players to try to drug their way to the big pay day. Kids all over America are now taking steroids in hopes it will help them earn their way to college and then to pro sports and the mega bucks. All of this has hurt the fan in the pocket book as well. Most fans can't afford to pay the enormous cost of going to a professional sports event anymore. Taking the whole family to the ball park is almost like spending their entire annual vacation savings on one game. The big corporations buy alot of the tickets and then hand them out to customers. They get tax breaks for this "business expense" so once again the tax payers get screwed. Big cable TV contracts have made the owners and the players rich beyond imagination. Then the greedy owners turn to the cities and demand the tax payers build new fancy stadiums or they threaten to move to another city. The time has come for the fans to speak out. Take the big money out of the game. Reduce ticket prices so real fans can afford to go to the games. Take the teams away from the greedy owners. Return sports to its proper place in our society. It's only a game. Corporate control of sports is the problem. Corporate control of everything in our society these days is the problem. Until things change I suggest a boycott of pro sports games. The mainstream media was abuzz days ago when Oprah Winfrey traveled to Iowa, New Hampshire and South Carolina for campaign appearances with presidential candidate Sen. Barack Obama (D-IL). Obama is closing in on Hillary Clinton in Iowa which will be the first state to vote in the 2008 primary campaign horse race. There is a media generated perception out there that Obama is an anti-war candidate. This is far from the truth. I heard him with my own ears say in a recent debate that if elected president U.S. troops would still be stationed in Iraq at the end of his first term in 2013. Other leading Democratic Party candidates Hillary Clinton and John Edwards said the same thing. About a year ago I was watching C-SPAN one day and saw an interview with a Chicago Tribune reporter who has covered Obama's rise through Illinois politics. The interviewer asked the reporter, "Isn't Obama too radical to be elected president?" The reporter responded, "No, you don't understand. Obama has a very good relationship with the Chicago banking community." Now that is a very telling statement. To be one of the acceptable candidates of the banking community means that you have passed the smell test. That essentially means you will not challenge the power structure in any real way. It means you will do nothing as a president to interrupt the corporate empires ability to make money from endless war for oil and other diminishing resources. If you watch Obama closely he does not say much of substance in his speeches. He talks alot about bringing the nation together, the red states and the blue states, and says that things need to change in Washington. All feel good talk for sure. But he makes little noise about changing the dynamic in America where the rich are getting richer and everyone else is getting poorer. He says little in terms of ending the occupation of Iraq or preventing a new war with Iran. He says nothing about ending the power of the military industrial complex. His health care plan is all about helping the insurance companies have greater access to our wallets. He thinks impeachment is a waste of time. Obama is a good politician who knows how to play the game. The power structure knows the voters are angry about Iraq, about the declining economy, about the lack of health care. They know they need to put candidates into place that can control the steam valve of American public opinion by appearing to be responding to the people. But these candidates, most importantly, need to remember who their daddy is. In the case of Obama he actually protects the purse of the bankers and big boys that run the show. Thus he is an acceptable candidate. 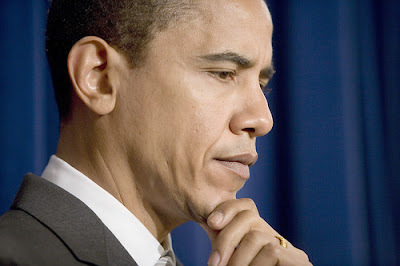 Glen Ford, director of the Black Agenda Report, recently wrote, "Through his own statements, Barack Obama relentlessly destroys his former anti-war credentials. In an effort to establish himself as a 'statesman' in the eyes of the power structure, Obama now advocates a much larger Army and Marine Corps to allow the U.S. to 'lead the world in battling immediate evils and promoting the ultimate good.' Do not expect a 'peace dividend' under a President Barack Obama. The only genuine peace candidate [in the Democratic primaries, along with former Alaska Sen. Mike Gravel] is Rep. Dennis Kucinich, of Ohio - which is why the corporate media pretend Kucinich doesn't exist." While just in Florida we took a one-day side trip to St. Augustine to visit our dear friend Peg McIntire. 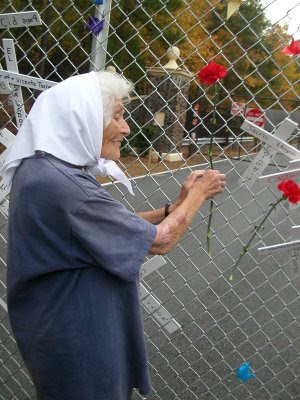 Peg just turned 97 and remains active in the peace movement. 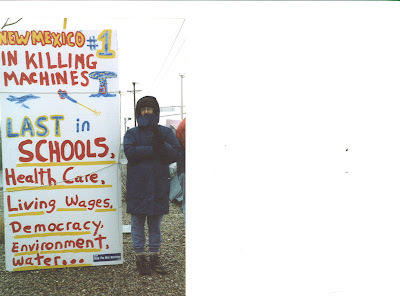 The photo above is her at this year's School of the Americas demonstration at Fort Benning in Georgia. The day we visited Peg she had spent the morning surveying the public in front of the public library on homeless issues. She told us that a few days before she had gone north to Jacksonville to speak at a rally and in October she had travelled to Orlando to address a big anti-war event. I've known Peg for at least 20 years and she has become like a second mother to me. For many years she served as the Treasurer of the Florida Coalition for Peace & Justice which I coordinated for many years. She has been a loyal member and supporter of the Global Network since its creation and has been arrested doing civil disobedience at the space center in Florida numerous times. Peg, in addition to all her other activities, still ably coordinates her chapter of Grandparents for Peace. As I write this the Congress is working on a new funding bill for the Iraq occupation and the war in Afghanistan. Once again it is likely that the Democrats will talk big about ending the occupation and then in the end roll over and give Bush the money he wants. The money that is being wasted on war making is just mind blowing. Just days ago we heard that the Pentagon has lost $1 billion in Iraq. How could that happen except for outright stealing or handing the money over to the "enemy" so they can buy more weapons on the black market thus giving the U.S. a "good excuse" to stay in Iraq because it is such a mess. Now a new story has come out saying that the Army is undertaking a $200 billion modernization program (called Future Combat Systems) to make all their forces "net-centric". According to an article in the Washington Post, "The project involves creating a family of 14 weapons, drones, robots, sensors and hybrid-electric combat vehicles connected by a wireless network. It has turned into the most ambitious modernization of the Army since World War II and the most expensive Army weapons program ever, military officials say." In real terms double or triple that cost estimate and you get an idea how much of your money will be thrown down the rat hole on this one. What happened to all the fiscal conservatives? Hell, they are getting rich off this stuff. Today, the Army program involves more than 550 contractors and subcontractors in 41 states and 220 congressional districts, a wide dispersal of Department of War funds that generates political subservience. Ok, so what does Peg have to do with the Army's Future Combat Systems program? What is the connection? First, I'd say that Peg's life indicates that we have to be committed to our resistance work as a lifetime goal. We can't just dabble in it as a sideline. Age is not a ticket out of the struggle. Peg is in this for the revolutionary change that is needed. Secondly, we have to understand that just writing letters or showing up a demonstrations is not enough. Sometimes we have to step across the line at our non-violent actions and go to jail if need be. You can imagine the attention she gets when she takes such a step and gets arrested. In Florida she is a legend. Lastly, I'd say we can learn from Peg that a sense of joy, hopeful expectation, and wonder is important to maintain as we do our work. She is never naive but is always ready to embrace the unexpected. She reaches deep into people just by her own unwavering steadiness. Peg, unlike me, does not preach. She just sets an example by her actions and her life. Zillions of people have told Peg "I want to be just like you when I grow up." I am one of those people. Just a few days ago Albuquerque Mayor Martin Chavez, a three term mayor, surprised everyone with an announcement to withdraw from the race to replace retiring U.S. Senator Pete Dominici. Chavez had been the first major Democratic Party candidate in New Mexico to announce for the seat two months ago. Then a month ago Tom Udall, Democratic Party Congressional representative from northern New Mexico announced for the same seat. The political airwaves have been hot and heavy ever since. Mayor Chavez said in his message that it is his desire is to preserve and increase Democratic Party unity in Congress to stop the illegal war in Iraq and he wished now to work to help Rep. Tom Udall win the senate seat. A bloody and expensive primary battle between Chavez and Udall would be unwise he said. I sent a thank you note to the Mayor for his concern in the struggle to end the war in Iraq and bring our troops home. I wish the Democrats in Congress had the resolve to stop the war in Iraq as the image seems to appear to some. I think the mayor made two major strategic blunders when Rep. Tom Udall announced his campaign to win the senate seat. These missteps were fatal to him and they tell us something important about the changing base of the U.S. electorate and the race to militarize space. Mayor Chavez first tried to play the race card, almost like Republicans using immigration to divide the public. He said Udall, an Anglo was not Hispanic enough for New Mexico. This did not unite his perceived base of support. The anti-immigrant and anti-Hispanic message also worked to damage Gov. Richardson a Hispanic running in Iowa as a unity candidate for the nomination for president. Wow, what a blunder. But more important, when this did not work Chavez then tried to up the ante with a message that he would boost efforts to keep open the nuclear weapons factories of Los Alamos (and Sandia NL). Congress has moved to cut the funds and Rep. Udall spoke of diversifying the nuke labs mission. Chavez lost ground on this too as many in the state know there must be a new mission for the labs away from nukes if they are to survive, and Udall has made statements to that effect. It is obvious too that the labs have not brought us security nor ended poverty, illness and inequality in the state. Chavez was proof of that point. Chavez says he got feedback in his polling and from friends that his high visibility attacks were way out of touch with the the public and probably the governor and many others. He said it was time to look for new horizons. If this is true it means the larger trend of the public moving left, or away from war and militarism is a deep rooted phenomena for New Mexico is a special place in this whole historical development. I think we saw some of this in the mandate last November for the Democrats to work to end the wars in the Middle East. They have not yet acted on that message and what is interesting is that we can see it is having a direct impact now in a key Senate race in a core state in the military-industrial complex, New Mexico. Our state has had its fate intertwined with nuclear weapons since the Manhattan project. Mayor Chavez was a casualty of the old guard political order not having learned some key lessons. Now the questions emerge about what it means for Gov. Richardson who is saying we need to dismantle the U.S. nuclear weapons arsenal. This was at odds with Marty Chavez obviously and with the workers here tied to jobs in the nuclear weapons industry. But these is more to this than meets the eye. Two years ago this month my wife, Jeanne Pahls, and some other anti-nuclear activists were invited by Gov. Richardson to his office in the Roundhouse. The governor it appears now wanted to sound out some in the peace community as he was preparing his move into the presidential race. Jeanne asked the governor to take a stand against nuclear weapons and the WMD factories in our state. She presented him with a petition with over 8,000 signatures calling for dismantling the WMD stockpile at Kirtland AFB inside Albuquerque. The governor ignored her request. Later as the nation engaged in the 2006 national election campaign for Congress the Baker Commission issued a report calling on the president to address the war with a new mind and solution. Implicit, but not noticed in this report was the notion that we had to get away from WMDs as the key issue and onto a coalition path to relations with the region. Then on Jan. 4, 2007 the Wall Street Journal carried a major opinion piece by notable U.S. political voices William J. Perry, Henry A. Kissinger, George F. Schultz and Sam Nunn calling for an end to our hypocritical stance on WMDs. They pointed out the hypocrisy of us saying that we can keep our WMDs while everyone else does away with theirs. This reality political show took roots with Gov. Richardson who has long been associated with HenryKissinger and the neo-liberal political school of thought. Richardson soon came out as a peace candidate, calling for an end to the war in Iraq and an end to the U.S. nuclear weapons arsenal. It is obvious Marty Chavez was not following the same text as Richardson has been moving on, he obviously was not listening to the grassroots in his own state. A lot of people then began saying that Gov. Richardson had made a major turn around but I don't think that is the case at all if one understand the goal of the neo-liberals and what is going on the the restructuring of the U.S. military with a new set of technologies and strategies. For example, a couple weeks ago the U.S. Air Force announced plans to create a new cyber warfare center for future war fighting. Gov. Richardson who was in Iowa campaigning for president quickly issued a call to have the new war center set up in Albuquerque, NM at Kirtland AFB. Kirtland AFB is a center of the most advanced war planning which includes Iraq, on the other side of the globe and a key center for military restructuring plans. The publications of the Space Command and the research center at Kirtland AFB state they are leading the world in supremacy for control of the cosmos, to dominate the high ground of space for control of the earth across a broad spectrum of war fighting capabilities. The U.S. military is moving rapidly away from a strategy based on messy and expensive nuclear weapons to a more sophisticated plan for the building of a global empire. You can't rule a planet wasted by radiation. The U.S. Army has just revealed they are planning to spend $200 billion to build a war fighting capacity based on wireless and Internet technologies, none of which are possible without secure access to and control of space which is where the satellites are that link all the new technologies together. Not only that but as Jonathan Shell has pointed out there is the urgent danger of the linear spread of nuclear weapons now, other nations learning how to build and use nuclear weapons in their fight for self-determination. With the collapse of the Soviet Union as a counter balance in the Mutually Assured Destruction doctrine of warfare smaller nations are realizing that if they are to avoid being colonized they must have nuclear weapons too. This is a danger the neo-liberals like Kissinger, Nunn and Richardson are facing head on. Others like Marty Chavez have missed this turn in the road to the future. New Mexico's Gov. Richardson has been campaigning with a new image of being for peace and an antinuclear activist but what he is doing really is following the Baker, Kissinger, Nunn plan of quickly acquiring the holy grail of new age weapons - the control of space, or the militarization of space. The result is a new arms race in space that few in the U.S. electorate have noticed. Other nations have noticed this new development. China, Japan, France, Israel, India and Russia are moving to acquire new capabilities in these areas of future warfare. None of the global war fighting capabilities the U.S. empire needs can be accomplished without securing outer space, much like securing the seas of the old age was key to control and commerce then. Once ports around the world were key for a global navy, now it is secure satellites that are key. China's recent destruction of one of their obsolete satellites with a simple earth launched missile was a plea to everyone to negotiate a treaty on weapons and war in space or face a new arms race that will be staggering in costs. Everyone seems to want to avoid this, everyone except the U.S. The response of the U.S. political establishment has been to ignore the global demand for a solution and to push ahead with new unilateral and taxing expenditures for more high tech weapons. The U.S. plan is actually in scale larger than the old Manhattan Project. We see it in cuts to social and human services, even to veterans coming back from the ground wars in the Middle East. They are spending like crazy to grab as much of the high ground of space as possible in the shortest period of time before the public catches on. Gov. Richardson is in tune with this imperial mission while appearing to be a new peace leader. During his tenure as governor many new space weapons systems have been developed and centralized in New Mexico with his support and encouragement, not criticism and discouragement. The new Air Force cyber war center is for him a complement to the directed energy, laser, anti-satellite and other exotic weapons developed here. To us they are like the V2 rockets of the Nazi regime. This is the situation the peace movement and the nation finds itself in. The public is moving away from war and nuclear weapons but has not grasped yet the new plans of the empire builders who still run the show in Washington. At the grassroots we need to take into the elections the message that yes, we want to end the war in Iraq, to end the scourge of nuclear weapons but we also want to keep war and weapons out of space, that we want a funding of human needs, not massive expenditures for war profiteers, as Pres. Eisenhower warned us about, in 1961. The recent Chavez-Udall debate over the struggle for Sen. Pete Domenici's seat in Washington has illuminated new challenges for those working for a just and democratic society across the planet. - Bob Anderson (Stop the War Machine) Albuquerque, N.M.